We’re not monkeying around. 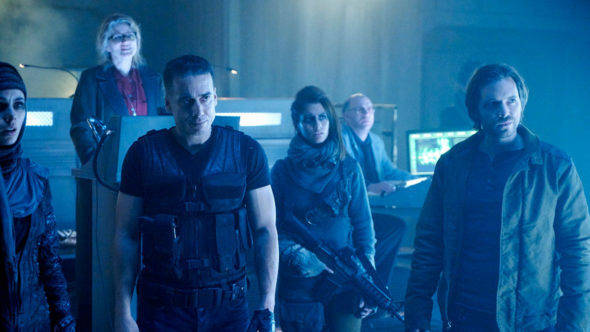 The 12 Monkeys TV show has been renewed for a third season on Syfy, according to EW. The futuristic sci-fi drama, set in the 2040s, involves time travel after a virus has wiped out much of Earth’s population. The 12 Monkeys TV series cast includes: Aaron Stanford, Amanda Schull, Emily Hampshire, Barbara Sukowa, Kirk Acevedo, Todd Stashwick, and Noah Bean. The mystery drama series, based on the 1995 feature film starring Bruce Willis, Brad Pitt, and Madeline Stowe, was created by Terry Matalas and Travis Fickett. 12 MONKEYS follows the journey of Cole, a time traveler sent back in time from a dark, hellish future to prevent it from ever happening. Joining forces in the present with Dr. Railly, Cole must defeat a centuries-old malevolent organization known as the Army of the 12 Monkeys. As Cole, Railly and their unlikely allies get closer to the truth, they’ll learn there are deadly consequences for all of history … and time itself. Check out all of our 12 Monkeys TV show coverage. What do you think? Are you a fan of the 12 Monkeys TV series? Do you plan to watch season three on Syfy? Tell us. 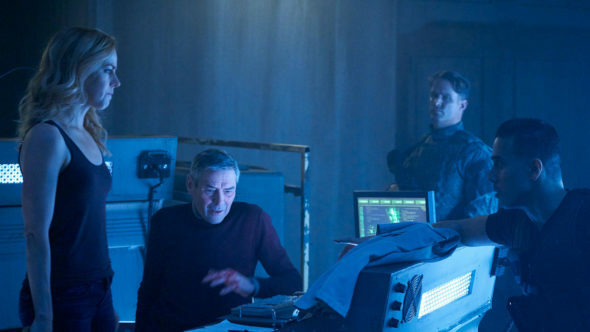 More about: 12 Monkeys, 12 Monkeys: canceled or renewed?, Syfy TV shows: canceled or renewed? I am thrilled that there will be a season 3. Personally I hope there are many seasons even beyond 3. There are many reasons why some people are not able to watch any given show at its original airtime. Until you can catch the number of viewers who record the show for viewing later you won’t get accurate review numbers. People who work evenings or have school or taking care of kiddos until bedtime actually account for lots of people. Please keep the show going. I am glad 12 Monkeys will be back as I’ve thoroughly enjoyed the first 2 series, This is a really good show as is Sleepy Hollow on Universal channel. I so glad 12 monkeys has been renewed . This TV series is a well written series..so much fun to watch…and forget about the mess in the world..for a short while anyway..please keep this going and I speak for a lot of wonderful folks. My husband and I have been watching since the beginning. We are big fans and happy that it has been renewed for a third season! A great syfi show that is much more interesting than the original film. The characters are more developed and the episodes are filled with twist to keep you interested week after week. Thank goodness, love the show. I am thrilled at the news of 12 Monkeys getting a Season 3, especially after watching the latest episode to not give us “true” fans of the show would be like cutting your nose of to spite your face. I thank the TV gods for allowing us to continue to get a glimpse in the the world of Cassie, Cole and Jennifer!!!! it’s nice that the show was renewed for the real fans, but everyone at SYFY should FIRED! NOW! The LOWEST RATED SHOW in the history of television to be renewed. Maybe they’ll bring back Wynonna Earp now. NBC Universal is a DISGRACE. They should fire EVERY MORON THERE TOO. Is there a cancelled show you wanted renewed? They canceled Dominion and Helix for no real reason. Now they renewed 12 Monkeys being scared of too many people understanding their pathetic silly mafia tactics at cancelling shows with low fake ratings. The ratings are always tampered with by studios managers. It is great that 12 Monkeys gets another season BUT the fact that they managed firing excellent productions before it is no excuse. Yes it’s fairly low rated on “Neilsen” Live viewing. But look at all of the scripted shows, almost every show is going down 40% every year. There international ratings, online, on-demand, dvr and other non-neilsen ratings data must be important to syfy.